Varathane 106g Premium Wood Putty is an easy to use, non-hardening wood putty. Ideal for filing nail holes and minor defects after assembly and finishing. Dynamic Putty Pencils quickly hide nail holes and defects. Simply rub over hole or defect until filled, then wipe away excess. Designed for use on finished wood only. Does not shrink, crack or change colour. This product is non-toxic, non-flammable and odourless. Repair defects on furniture, cabinets, floors and woodwork with Trade Secret Fill Sticks for Light Wood Tones. Simply rub the sticks into the repair, wipe off the excess and the wax will contour to the repair. The wood tone trio pack ensures the right colour every time! Make scratches on finished wood surfaces disappear in seconds with the Trade Secret Scratch Remover Intro Pak. This unique and economical set of, both, Dark and Light Scratch Remover allows you to tackle touch-up jobs on any colour wood tone. Simply wipe on then wipe off to hide nicks, scratches and other surface imperfections. A great tool for quick and easy camouflaging of minor surface damage to finished furniture and floors without the mess of nasty chemicals or the hassle of refinishing. At the same time, the Trade Secret Scratch Remover cleans and revitalizes the surrounding finish. Don't ignore it, restore it! Restore your furniture to its original beauty with Trade Secret Scratch Remover for Dark Wood. Simply wipe on then wipe off to hide nicks, scratches and other surface imperfections. A great tool for quick and easy camouflaging of minor surface damage to finished furniture and floors without the mess of nasty chemicals or the hassle of refinishing. At the same time, the Trade Secret Scratch Remover cleans and revitalizes the surrounding finish. Don't ignore it, restore it! 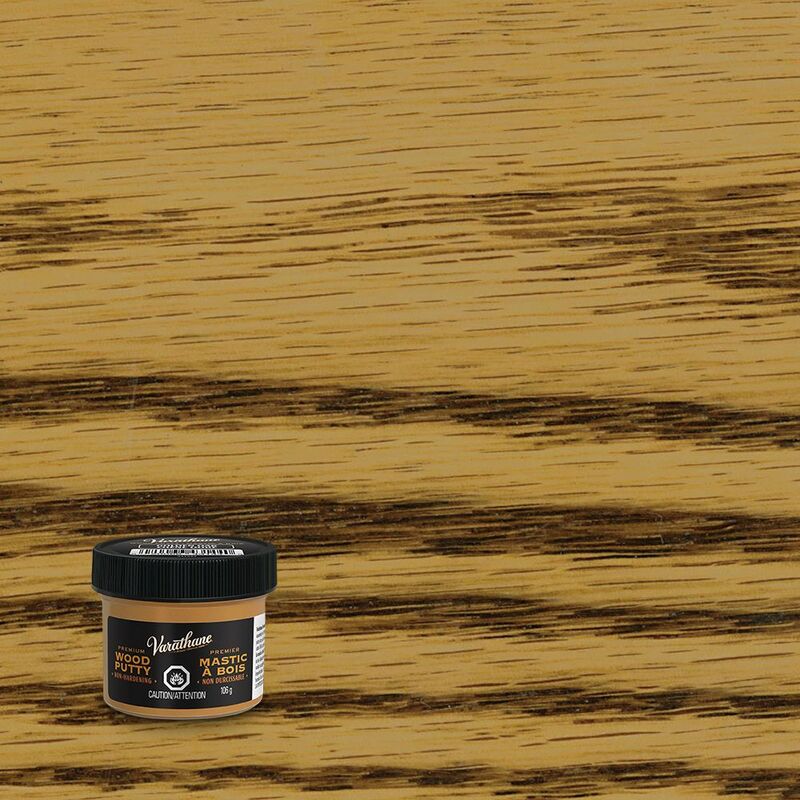 Wood Putty Golden Oak 106G Varathane 106g Premium Wood Putty is an easy to use, non-hardening wood putty. Ideal for filing nail holes and minor defects after assembly and finishing.